Levi Brooks (arrived at Eagle Rock in January of 2015) – Levi is originally from Fort Collins, Colo., and is a member of the Ponderosa House. Being among the veterans in the house, Levi became a centrifugal force in keeping things on an even keel within that house. Some of his involvements at school were duties as a Lead Ambassador in a student-based program that provides tours of campus for visitors. He was also aspiring DJ. That’s why you could most often find him in the Motif recording room, at choir practice, or serving as a Guardian of Sound — a designation only given to students who show leadership, responsibility, and a passion for music. He was also a part of Mag 7, which is a campus group featuring our school’s seven most veteran students who together focuses on various leadership roles and opportunities. Staff members often rely on them for support during evening duty shifts. Levi’s short-term plans are to attend Front Range Community College in Westminster, Colo., and study music, specifically related to electronic dance music (EDM). After earning his college degree, Levis wants to perform at important EDM festivals such as Miami Ultra or Tomorrowland in Belgium. This is aligned with his passion of traveling, which is why another life goal is to travel the world. Emiliano Vivanco (arrived at Eagle Rock in September of 2015) – Em, for short, is from San Francisco, Calif.,and has been a member of both the Spruce and Pinon House. Even though he resided in both houses, he was seen as an important member of both, displaying leadership for each. Em participated in various activities during his schooling at Eagle Rock, including his support in creating a restorative action system through the Lost Creek camping trip and Wall Tent. The latter is a week-long camping trip on campus where students have the opportunity to reflect on their involvement and attitudes on campus. He is also an avid performer, participating on a number of occasions in our school’s musicals. When he heads home, he’ll enroll at Community College of San Francisco while working with his godfather in a general contracting business. Then he wants to explore the possibility of becoming an aerospace engineer, and maybe working for NASA. Marcus Wade-Prince (arrived at Eagle Rock in September of 2016) – Marcus is originally from California and has been an amazing asset to Aspen House. Throughout his time here, Marcus has been involved with Mag 7, as well as being a Lead Ambassador. He has been involved in various conferences, such as Spark House and other trips to Vermont, including the creation of a Big Picture philosophy model to support the Estes Park school system. He has also participated in Brave New Voices, which is a national association and conference for professional and aspiring poets. Marcus’ plan right after graduation is to pick a college from among the several offers he has received, and following graduation, travel to least two destinations he’s never been to before. As for the college experience itself, Marcus said he’d like to live on campus for a couple of years, followed by a move off campus and into his own apartment where he can be independent and find his sense of purpose. 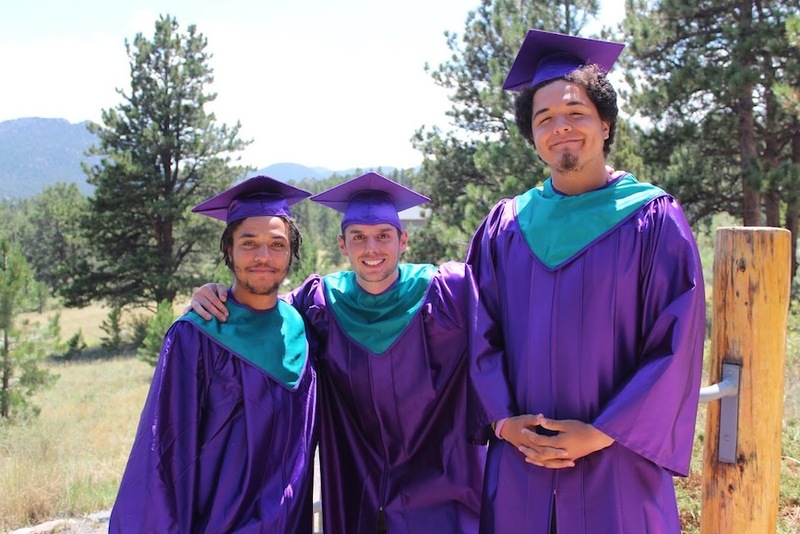 Again, the August 10 graduation ceremony begins at 4 p.m. Mountain Time and will be broadcasted live through Facebook. To watch the event, visit https://www.facebook.com/EagleRockSchoolshortly before 4 p.m. Mountain Time Friday. This entry was posted in Meet The Student and tagged Aspen House, Brave New Voices, Community College of San Francisco, Emiliano Vivanco, Front Range Community College, Graduation, Guardian of Sound, Levi Brooks, Mag 7, Marcus Wade-Prince, Piñon House, Ponderosa House, Spruce House. Congratulations Em, and congratulations to all the graduates!!! Well earned, and I look forward to seeing how you all shape the world.